This is a version of the standard late pattern F.A.A. C-type with zipped earpieces. 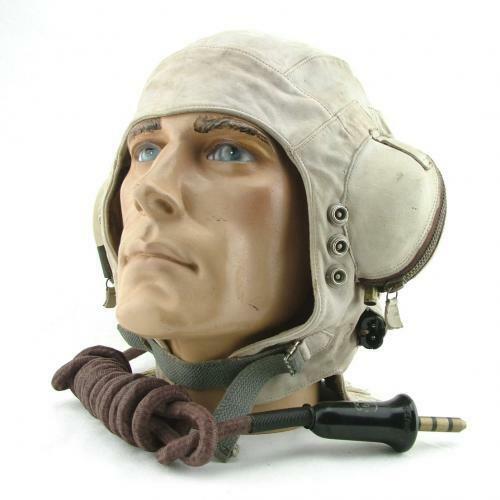 Originally these formed part of a complete one-piece immersion suit which was both bulky and unpopular - hence many helmets were separated/cut off and worn alone. Made of unlined white tanned cape leather treated with Alum salts to increase water repellency. It is very similar in appearance to the standard late pattern C-type bar minor wiring channelling variations. Size 3 (seems slightly larger). The leather is in very good condition and apart from some relatively minor staining/marks is remarkably clean for a white helmet! It is completely supple and free from damage or notable wear. Both earpieces are good with excellent zips - each complete with the original leather puller tags. The inside of the helmet has less than average soiling but obviously shows signs of glue residue where originally bonded to the flying suit. All of the straps are good and retain virtually all of the original brown coatings on the press studs. Very good chin strap retaining colour and elasticity. Internally wired with full dark 'chocolate' coloured loom, jackplug (spring loose) and receivers. The earpieces are also fitted with a have a pair of flexible sponge rubber ear cushions. The receiver carriers are suitable for use with Gosport tubes too. Faint size markings on the lining. Crown and anchor embossed externally. A rare helmet in very good used condition. Stock code H21523.